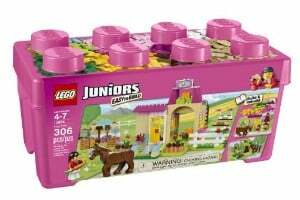 Lego sets for girls have become a popular gift idea for parents yearning to let their little daughters become more creative and use their imagination. You can see lots of selections in toy stores, from fairies to castles and just about anything else. Lego was established 70 years ago. Everyone from young children to the young at heart love these colorful bricks. If you are one of those parents who is excited to get a hold of a Lego set for your daughter, then let me take you on a tour of the best sets for your little girl. Whether your child loves the song “Let it Go” or the characters from the hit movie, this set will undeniably enable your child to be an Elsa, Anna or Olaf. 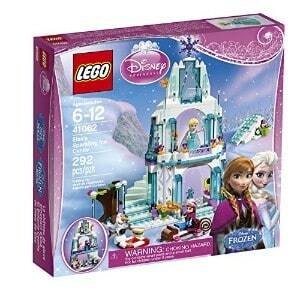 Frozen and Lego have one of the best combinations for this craze. The three most loved characters are present in the set together with 292 other pieces. What's Great About It: If you are collecting Disney line sets, this could be one of the additions. The Ice castle appears to be icy-looking and for its size, you get good value for the price range. There are some unique play features which you would otherwise not have expected to find that your kids will love. This set captures the hearts of pre-teen girls. The models are done intricately which makes them look realistic, starting off with some accessories in the bedroom to drawers in the kitchen. It comes with 695 pieces which makes the imagination of building a house more fun and exciting. The doll figurines that are included are Olivia, her parents, and Kitty, her pet. What's Great About It: The great thing about this one is that even boys could play with Olivia’s house. Girls and boys can use their imaginations without limits. Small details like orange juice cartons, a diary in the bookshelf and perfume bottles make the simulation play more realistic. For a child who loves Lego, getting one mini gift at a time from the start of December until Christmas day is priceless. 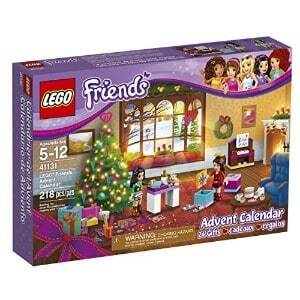 On the 24th, she would have a completely new set in time for the festive atmosphere, with 228 pieces in total. This box gives relevance to the holidays and is distinctly different to the sets she receives during the rest of the year. What's Great About It: Having one tiny gift to unwrap each day will give your little one something to look forward to every day until Santa visits. The pieces could be as grand as the Christmas tree or as lovable as the furry pet. What comes next will always be a surprise that your daughter will adore. 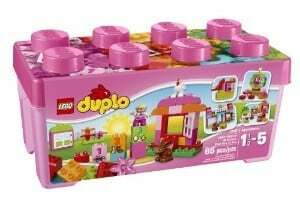 Two mini figures, 402 pieces of Lego, a building plate and a box serve as the perfect play set for your little girl. Your daughter could create a dog, car, house and some other basic things in 12 brightly colored bricks and pieces. What's Great About It: This box addresses all the complaints from the previous one created several years ago. The box itself is bigger and has more space for you to put in additional bricks. 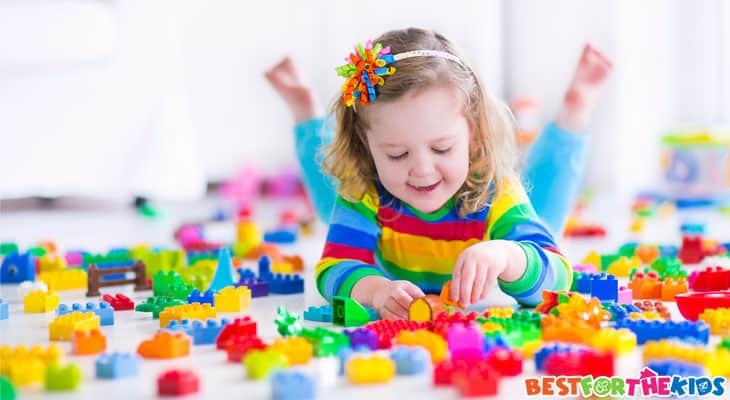 The pieces altogether introduce your child to a simple yet exciting building technique which they can start with and then build upon. 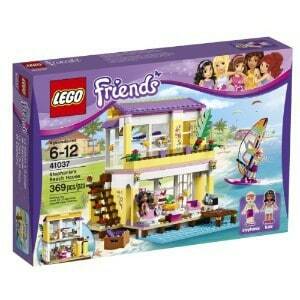 For summer and fun, this set is made for every young girl’s dream of having a beach house of her own. Windsurfing or just hanging out at the edge of the porch makes summer a beautiful season to look forward to. This set comes loaded with 369 pieces which makes up a two storey house which is complete with some detailed amenities that your little one will absolutely love. Stephanie, Kate and your daughter will surely enjoy their summer together. What's Great About It: The intricate details like the flower pots make the house vibrant. The surfboard looks so real that you just can’t help but play with it. 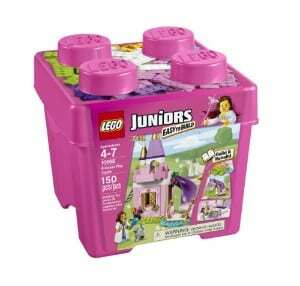 This is another addition to look forward to if your daughter is collecting the Lego Friends sets. This 379 piece set will make your little one sing “Under the Sea” all day long. Flounder and Princess Ariel will be able to enjoy all of the bits and pieces of their castle complete with accessories the clam bed, clam shells, seaweed, and a 9 inch castle. 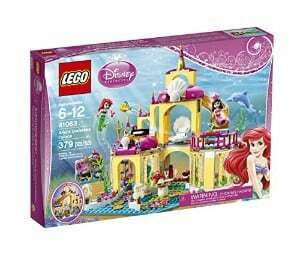 Princess Ariel isn’t alone - her sister is also included in the set, giving your daughter plenty of pieces to play with. What's Great About It: The vibrant colors will define the imagination of your child. There is a slide which adds to the fun of playing with this set. The details are also well conceptualized. This is a good set for your Disney collection. 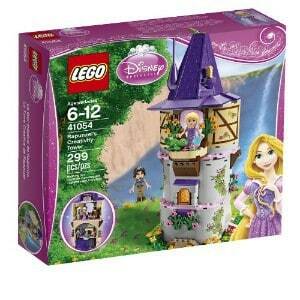 One of the best movies from Disney in partnership with Lego, this 299 piece Rapunzel set isn't a surprise hit to many. The tower is 12 inches in height and is tall enough to spark the imagination of your child. Remember Rapunzel's hobbies? A colored palette, baked goodies and her oven are present and of course, the brush which defines her. Flynn Rider and Rapunzel will be able to take an adventure through the eyes of your young girl. What's Great About It: This is basically a good dress up play set that makes it a little bit different than the rest. All of those basic details which we see from the different scenes of the movie are there. One thing that they also thought about is Pascal, the chameleon. It brings a little fun to the simulation. Fancy a little trip around the lighthouse? 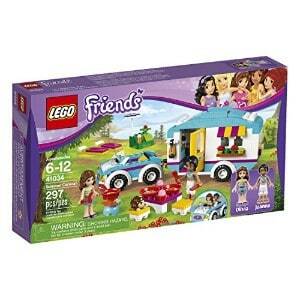 This set contains 473 pieces with two figures included. No matter what kind of weather it is, an ice cream is always the solution to everything. Exploring, rowing the boat, and plenty of other adventures make up this set. Use the binoculars to get a closer look at nature. What's Great About It: The little camera makes the adventure so realistic as it is a whole new view from the top of the lighthouse. Jump into the boat for a fresh breeze through your hair. Pair this set with the Lego Heartlake Air Balloon for the perfect combination. This 279 piece set could open up the eyes of your girl as to what happens backstage. Go on and let her imagination grow as she learns to pretend play, choosing from the wide wardrobe of the stars, including skirts, wigs, hair accessories and beauty products. Emma and Livi, the two figures included, have their own vanity desk inside the fold out dressing room. When unfolded, the set measures 14 inches wide. What's Great About It: The intricate accessories give your child cognitive development as they try different kinds of outfits on their figures. Personally, I found the two characters were conceptualized well as they look like real stars. This would be a blast if it comes together with the Pop Star Stage Show set. With 150 pieces inside the set, your little girl will get a lot of pretend playing time as a little princess. 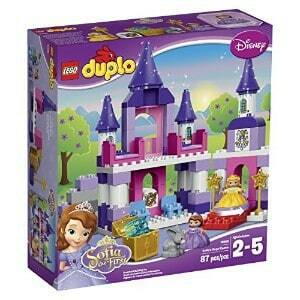 This set comes with one princess figure that happily plays around the castle. Aside from the big slide, there is a seesaw which adds more activity and an added table, bed and viola. There is a royal chamber that goes with it too. What's Great About It: This model, when finally built, is easy to play with. The slide is easy to access and it is much fun, especially as it goes directly into the water (and we love how much they love water tables! ), splashing a lot of imagination for your child. At a young age, this set will help build the creativity and problem solving skills for your little girl. This 1,120 piece Lego set brings out a lot of surprises for your little one. Speaking of surprises, you will find 4 figures from the Friends which are quite rare. This set contains a spa booth, mall shops, food court, sporty car and a walkway. This is one of the largest Lego Friends model sets and the excitement it creates is also huge, especially during the assembly of the buildings. This is a place where every girl would want to hang out. 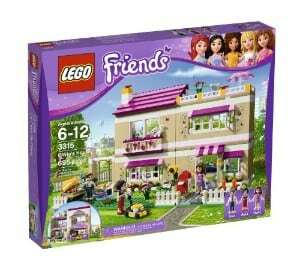 What's Great About It: It is a fresh breather from the usual Lego Friends scenes, but on the other hand, this is a good expansion for the sets. There are many surprises that one will notice during playtime. Because it is huge, there will be lots of fun times using the imagination. If within the budget, this is a great reward or a gift on a special day. This jungle theme would open up the imagination of your kids to a different kind of environment. This 473 piece model will let them create their own quarters, medical station, bathroom hut, and other accessories. Two figures are included in this set. What's Great About It: Since it is in a jungle setting, two cute animals are included as well which adds a little bit of spice to the theme. The tree house has a slide and there's a zipline going to the living quarters, both of which give the ultimate adventure which your little girl can imagine. Motor skills are promoted with this set. When things heat up, your child can just drive to somewhere cool and fun. This set has 297 pieces which make a caravan, picnic table, picnic set and two figures, plus a tiny animal to go with them. Your daughter will love the car with a trailer at tow in the back. This camping setting opens up a new idea to your girl. What's Great About It: This model offers a cute car which will be appreciated by your little girl. Mobile homes are introduced in this set. The design itself may be simple, but it has a lot of appeal for a little girl. This camper style improves your child's hand-eye coordination and problem solving skills. A medical bag with Emma and a cute orangutan is included in this 156 piece set, which will give your child the concept of helping animals and treating them with care and respect even outside the home. This set comprises of a banana tree for the orangutan to swing on, a side cart for Juliet to drive, a small bed for the patients and hours of fun playing pretend. What's Great About It: This is a small yet exciting set and it has a lot of features which your little one can play with. The medical kit even includes a teeny syringe to help the poor animals along the way. This set is well suited to be combined with other Jungle Play themes. This set is composed of the basic Lego bricks with 790 pieces of vibrant colors. This is something which your child could play well until she grows older. Included in the box are also a few sets of wheels, tires, eyes, and two base plates. What's Great About It: This is the champion of the sets all because imagination is well used here, and your child is geared up to making her own kind of structure. No limits or rules, just imagination. This basic toy will bring out the best in your child’s creativity. 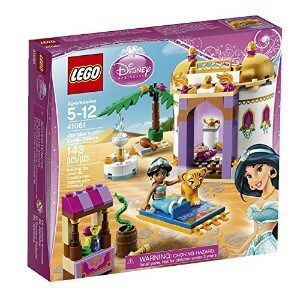 This 143 piece set is a smaller set, but it has a lot of potential through reliving the magic of Princess Jasmine and Rajah. This model is simple yet it flourishes elegantly, realistic just like in the Middle Eastern countries. The accessories fit quite well - the snake in the barrel, the palm tree and a fountain all add up together to create the dream of another popular Disney princess. What's Great About It: The Princess Jasmine figure can relive the movie with all the lovely designs and play features. The genie lamp included too, but unfortunately Aladdin is not present to rub it and let the genie out. This set would be the perfect addition to a Disney Princess theme collection. This is a 306 piece Lego set that teaches your child about living on a farm and letting her imagination run wild. This set includes basic bricks, a bench, a farmhouse, a garden and some accessories such as carrots for the horse, a saddle, and a bridle. A horse is not something to be missed when one is on a farm. What's Great About It: With easy and simple instructions, this set could be done by your child without your assistance. This helps in developing her building skills while expanding her imagination. Anything is possible when it comes to Lego junior sets. The fewer pieces don’t mean less fun. This set contains only 25 pieces, but it can be used to create easy-to-build animals like a giraffe, dog, worm, elephant and bunny. Even a toddler will be able to assemble these on her own. What's Great About It: With the help of the inspiration cards, learning can be done easily with or without your help at a very early age. The vibrant colors will guide your child and will help in the development of the motor skills of her little hands. Every little girl knows Sofia. She is one of the most popular princesses on the television these days. Disney and Lego took this wonderful character and came up with a perfect combination for young girls. This set includes 87 pieces that can be built into a dance floor that revolves, stairs, a purple castle, and chairs. In the box you will get Princess Sofia and Princess Amber plus her bunny pet. This set is designed to tickle the fancy of toddlers and younger girls. What's Great About It: Duplo is the version for younger children, thus ensuring that everything is suitable for your child's young age. This theme is set to help in stimulating the imagination and pretend play at a very young age. 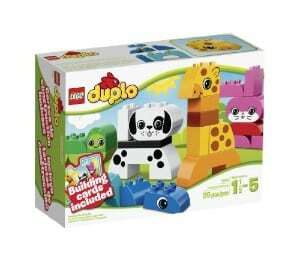 Motor skills and spatial intelligence are reinforced during play with this set. 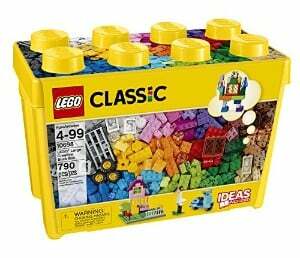 This box of treasure contains 65 large building blocks to cater to the creativity and imagination of toddlers and small children. These bricks have great colors to stimulate your child's mind and encourage them to make up their own structure. Your little one can transform the blocks into cars, trains and everything that she could think of. This set includes a figurine, a hen, and a bunny. All of these pieces come in a 4 × 2 block piece container. What's Great About It: With the vibrant colors, it will be easy to mix and match the bricks to create something out of them. As early as 18 months, your daughter will be able to distinguish and develop her creativity in a lot of ways. Because the bricks are big enough to handle, this set may come in handy for your little ones. There are a lot of Lego varieties on the market today – different themes and play sets that you can choose from. The ones we’ve mentioned on this list are based on consumer feedback and reviews. Likewise, the judgment of little girls was considered quite heavily. Gender inequality is a big problem in society and that goes the same with the toys which children play with. Fortunately Lego aims to address this issue. Their toys, in the past, were generally made for boys and even children noticed the gender gap. 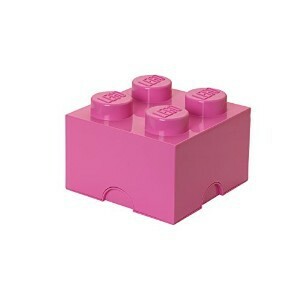 Lego started with the brick era in 1937 until late 1970's when both boys and girls equally played with these toys. Some decades after that, boy’s sets came flying off of the racks until 2012, when they saw the need for a turnaround. The tremendous increase in sales shows that girls are eager to learn and use their imaginations and critical thinking, just like boys, by playing with Lego toys. Every parent aims to help their kids develop their abilities starting from a very young age. Cognitive skills are developed through problem-solving, organization, construction, critical thinking, and motor skills development. Lego has come up with different ideas on how to help develop each child’s abilities. Now your daughter can learn through playing using any of the toys we have listed here. As mentioned earlier, you could do anything with Lego. Any of these sets will promote development in your child, so you certainly can’t go wrong with any of the items we’ve included on this list. The key is to pick one that your child will like. Hopefully our guide can give you an easier time shopping for that perfect Lego gift for your daughter.